Changed title from "German movil bunker." 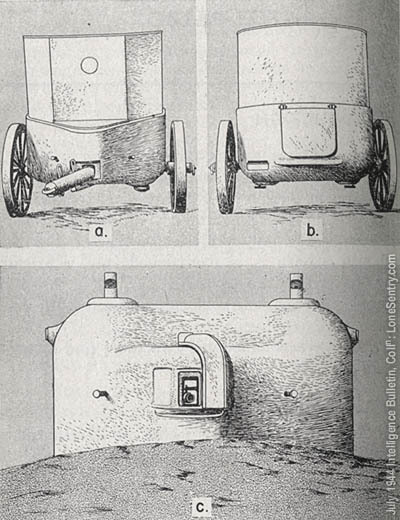 to "German mobile bunkers"
" Drawings of a shielded mobile machine gun (MG-Panzernest), it seems that the Germans had positioned some of them in the Atlantic wall and on the latter on what positions were they want to be installed"
See the draws and some pics here. Can be used in a wargame but not installed, to be in the process of it? For example, the Allied are going to atack a German defensive position with two or three lines deeply and in the last point of defense arrived a convoy with some movil bunkers and put them in state of be used. Any company may these movil bunkers in miniature? Great for a diorama also!. Used in Italy too. The Osprey book on the Italian fortifications talks about them. In Italy the Germans have been using a mobile steel pillbox, nicknamed the "Armored Crab," which made its first appearance on the Russian front in 1943. This pillbox (see figure) is mounted in an inverted position on wheels, and usually is hauled by tractor to a designated site, where it is overturned into a prepared cavity. After this, the exposed upper half of the pillbox (which is non-rotating) is camouflaged with rocks, earth, or local vegetation. The pillbox accommodates two men, and is armed an M.G. 42. In the front of the pillbox, there is a small embrasure for the machine gun, with an observation peephole above. When necessary, these openings are covered outside by a heavy metal shield, which can be moved either to the right or left of the embrasure by means of a lever inside the pillbox. On top of the pillbox are two collapsible periscopes, also regulated from the interior. The entrance to the pillbox is a small door in the rear; this is locked from the inside by means of two brackets. The machine gun is mounted on a single bracket mounting which allows a free horizontal traverse on a semicircular grooved slide. The field of fire is 60 degrees. Elevation and depression, which are limited, are accomplished by a small handle to the left of the machine gun. Forward of the machine-gun trigger, there is a leather cover to channel off the gases from the gun and also to receive spent cartridges. Attached to the cover is a metal tube. In turn, this tube is connected to a metal box fastened to the floor. The gases are expelled by a small fan situated beside the metal box. The fan is operated by two small foot pedals, one on each side of the pillbox. Each pedal may be worked independently. Air is expelled through a slit above, and to the right of, the door. Fresh air enters through a vent in the ceiling. Two folding seats are provided for the crew. There are two iron rungs which serve as steps to facilitate entering and leaving. Two leather straps are hung from the ceiling, near the periscope openings. At the rear of the pillbox, and near the top, there are two holes into which steel bars may be inserted to lift the pillbox on and off its trailer. When these holes are not in use, they are closed by metal plugs. Ammunition is stored on shelves below the machine gun, in the forward part of the pillbox. There are also two boxes for tools and spare parts for the gun. Space is provided for a field telephone. Inasmuch as only a small portion of the pillbox may show above ground level, the installation may be somewhat difficult to detect. Thorough reconnaissance is necessary. The pillbox can best be detected by the outline of its embrasure, its periscopes, and its flue pipe, and by flash and powder smoke when the machine gun is fired. Riflemen or mortar squads should demolish the periscopes, thus leaving the crew without means of observation, apart from the embrasure peephole. Rifle fire should be aimed at the embrasure. In a number of captured pillboxes, armor-piercing rifle bullets had made holes in the lower half (the walls of the base). Obviously, such fire is possible only if this portion has been uncovered by artillery or if it was not completely covered with earth when the pillbox was emplaced. Antitank guns should aim at the sides of the pillbox about 20 to 24 inches from the top, since the thickness of the armor there is only 1 inch. The most practical method of destroying these pillboxes is by point-blank fire from antitank or artillery guns. Since the field of fire is only 60 degrees, separate pillboxes may be destroyed by assault troops moving in on the vulnerable and unprotected sides and rear. As a rule, these pillboxes are used in groups, but, by neutralizing the supporting pillboxes, it is possible to isolate any particular one. When assault troops come up to these pillboxes, they should first clog the embrasure with earth and throw hand grenades at the trap door in the rear. If the crew refuses to surrender, the pillbox should be blown up. In attacks on these pillboxes, Molotov cocktails may be used against the periscope openings. If no explosives or gasoline bottles are available, stones or logs should be wedged against the door, to trap the occupants." A desperate measure from the Germans who finally realised that what remained of the war would be fought on the defensive. The Russians used almost exactly the same thing in the summer of '42. I have them not painted yet they but are looking good. They are without Machineguns or those were missing. I have loose machineguns I´ll use.